If you are reading this blog, then it is probably a safe bet that you are interested in the medieval period of history. We’re often curious about what life was really like inside medieval castles, and so we’re always combing the internet, looking for cool facts and websites about this amazing time and place. Recently, we stumbled upon this great website maintained by a fellow medieval enthusiast named Edd Morris. Edd loves visiting old castles and researching the lifestyles of the castles’ inhabitants. So, put on your medieval outfits, throw on some early music, and take a look inside the lives of medieval castle dwellers. According to Edd’s website, Exploring-Castles.com, although life in a medieval castle would have been orderly and organized, it would have been pretty smelly and not comfortable by today’s standards. Remember, this was the time before plumbing and in-door heating and air conditioning. As far as living quarters, the lord and his family would have lived with the (relative) luxury of private rooms. Privacy was hard to come by in castles, especially when it came to the bathroom situation. Since privacy wasn’t held in as high regard as it is today, toilets were often just long lines of benches with no separation. As interested as we are in medieval times, we would much rather leave this aspect far behind! 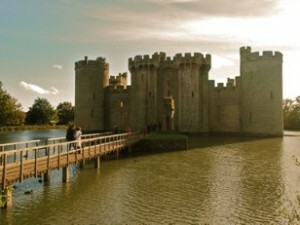 For more information, take a look at Edd’s site, Exploring-Castles.com!